Watch out, Legion of Doom! The Justice League arrives as 8-inch tall retro-style action figures! Figure sports cloth outfits, classic head, and the original articulation! Retro action figures are back! 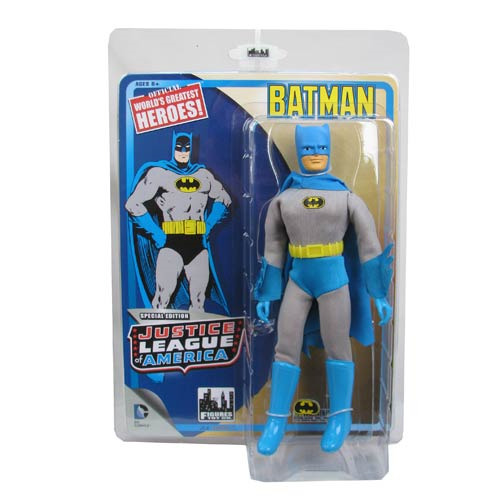 Each Justice League 8-Inch Retro Action Figure is inspired by the classic Mego figures of old, sporting cloth outfits, classic heads, and the original articulation you know and love. Inspired by a most extraordinary team, the Justice League 8-Inch Retro Series 1 Batman Action Figure and all of his buddies are sure to bring a smile to your face while punching the Legion of Doom in theirs! Ages 8 and up.